Remove string gunk easily and quickly. Prolongs the life of your strings. Microfiber Polishing/Cleaning cloth from BAM France! A great way to keep humidity levels up inside your guitar case! 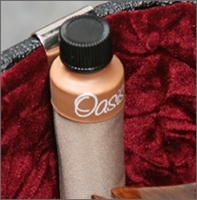 This style of Oasis® humidifier attaches to the inside of your instrument case to provide an optimum environment for your guitar. This style of Oasis® humidifier attaches to the inside of your instrument case to provide an optimum environment for your guitar. Guitar care essentials formulated by DjangoGuitars to keep your instrument in top shape!